Hello Quilt Lovers of the World! have some fun summer plans yet to do! everyone made Dan & her husband feel completely welcome at a new show! met, without you, "we" wouldn’t be - THANK YOU!! Where oh where is the Block Party van headed next? Grand Rapids Michigan! 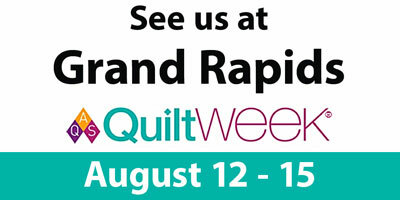 Look out, Patti & Sue are headed your way to the AQS Quilt show that runs August 12th thru the 15th, our booth is #1003.
we won’t be allowed to participate again!! It's time to start thinking about those hand-made Christmas gifts! 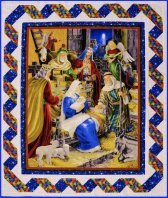 Take a look at "Rejoice" from Quilting Treasures, the panel is 36"x42" and is available on our web-site. Kits to come soon! This time in multi-colored tie-dye!! sorry to all our wholesale people! to an end, we all know what waits around the corner…..
SCHOOL! Only 20 days till our kids here start back, but who’s counting?